“The final solution to the immigration problem of course is a popular vote”. And a little later, a blatantly insincere defence of the phrase, on the grounds that the words had nothing to do with Hitler’s ‘Final Solution’, and taken out of context. Are you detecting something of a pattern here? Every time things get a little ethnic-cleansy, it’s walked back — as a mistake, a misinterpretation or a regrettable lapse in normally-solid standards. Words mean everything and they mean nothing, and intent changes every few seconds. Every little instance of white supremacy is realised through a toxic and poisonous mode of speech that rots the common faith we hold in language and meaning. It keeps happening. And it’s happened again. 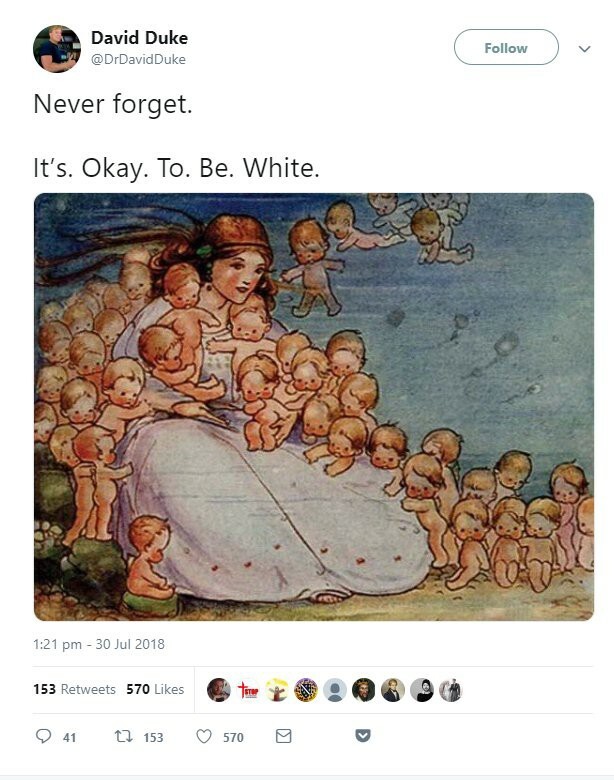 ‘It’s okay to be white’ (IOTBW) was spawned in the hellish, pasty-white swamp that is the image board 4Chan. It slots neatly into a wider project. If you can convince a powerful and comfortable majority that they’re under siege, you can convince them to approve of harm to minorities. So you weave a narrative of pseudo-discrimination. 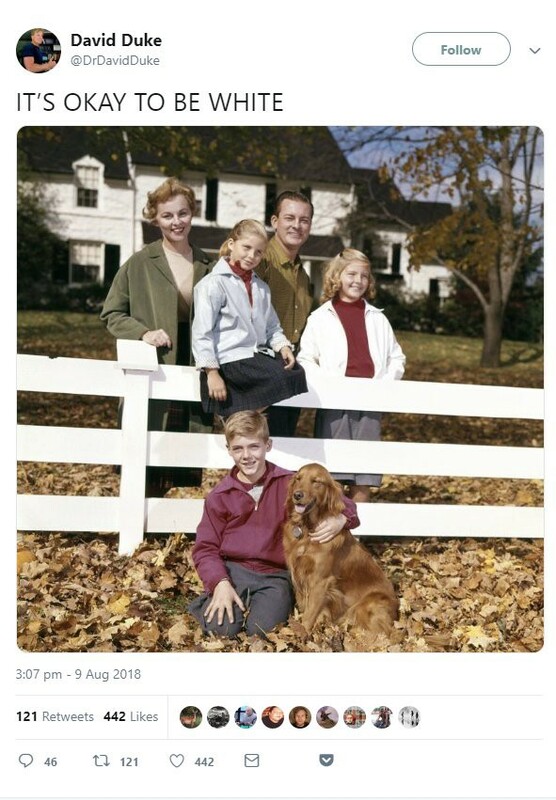 IOTBW slots in amongst ‘white South African farmers are being murdered’, ‘white genocide’ conspiracy theories and ‘reverse racism’. The Daily Stormer, a Neo-Nazi forum, led the charge. 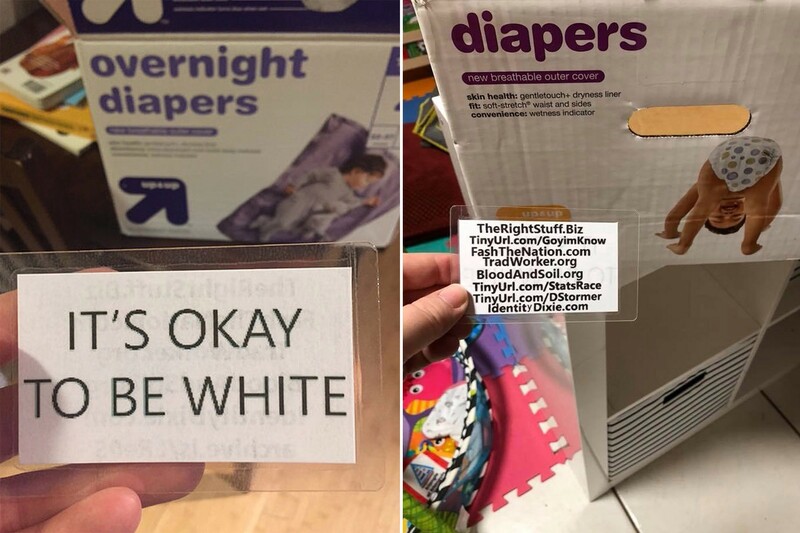 A Target employee in the US printed out cards with slogan and links to the white supremacist site and plugged them into boxes of nappies. There’s a weirdly specific obsession with interracial marriage (‘miscegenation’) in the hashtag. 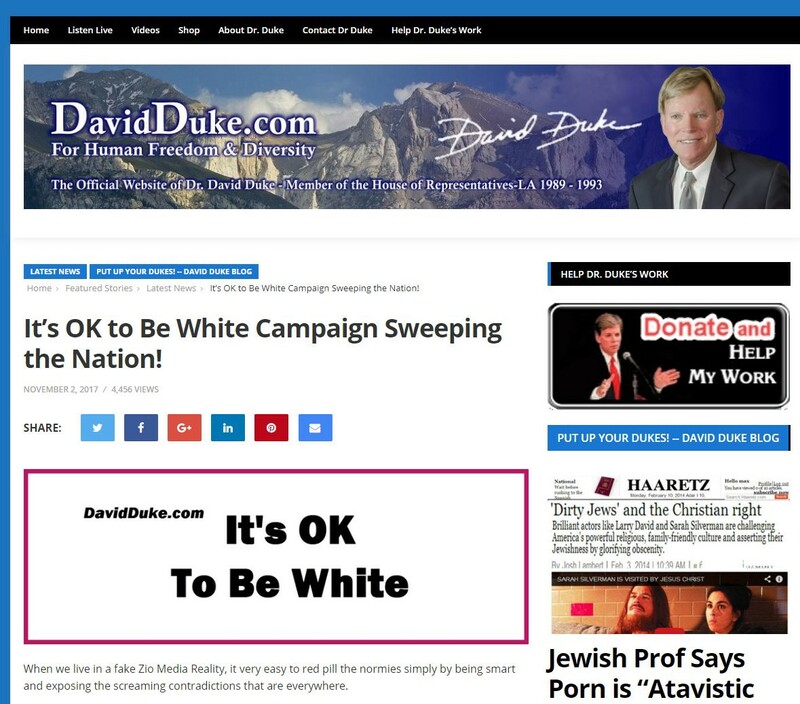 IOTBW was also championed by David Duke, former ‘Grand Wizard’ (I know, I know) of the Klu Klux Klan, which, let’s face it, slightly ruins more the modern Neo Nazi’s intentions for subtle branding and trolling. Incredibly, senators in the Australian government voted in favour of this motion. Though that wasn’t enough to get it over the line, a former KKK leader’s pet slogan was only four votes short of being acknowledged and affirmed by the Australian Senate. Later, attorney-general Christian Porter said the advice was sent out from his office “without my knowledge”. 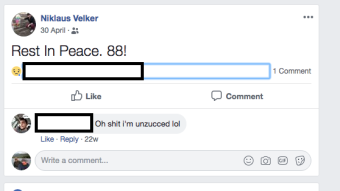 A staff member had sent it out without checking, he said. “Naturally I’m reviewing the processes in my office to prevent such an administrative error in the future,” he said. Let’s put aside the idea that someone might inadvertently mistake a motion moved by Pauline Hanson as opposed to racism, and the odd statements that accompanied the vote, seemingly affirming it. Let’s also put aside what it means to learn that “most senators don’t know what each individual division is about at the time”. Later, the government re-ran the vote, with the government joining the opposition in voting against it. The damage is already done — a toxic gas injected into discourse, and only the worst people win. I think part of the reason Australia such a perfect mark for these half-troll, half-actual-white-supremacist schemes is our tendency to solely consider words on their literal and hermetically sealed meaning, rather than interrogating their use. For the people who use the ambiguity of meaning as a tool in xenophobic advocacy, this is sheer perfection. Bannon: I don’t think economic nationalism has anything to do with race, in fact, what I keep saying here is, remember, it doesn’t matter if you are about your religion, it doesn’t matter your ethnicity, your colour, it doesn’t matter your gender, it doesn’t matter your sexual preference. All of that’s totally irrelevant. Ferguson: You say, that, and I’ve watched lots of interviews, and I’ve watched people ask you or accuse you in various ways of being a racist, and there’s no evidence that that’s what you are. First up, Bannon did say, of the Black Lives Matter movement, “What if the people getting shot by the cops did things to deserve it? There are, after all, in this world, some people who are naturally aggressive and violent”, and “when two-thirds or three-quarters of the CEOs in Silicon Valley are from South Asia or from Asia, I think… A country is more than an economy. We’re a civic society”. But aside from that, Bannon isn’t riding buses and shouting at brown women. He’s calmly delivering a series of unchallenged lies on Australia’s national broadcaster. To Sarah Ferguson, who conducted the interview, Bannon isn’t racist. Bannon weaves his ethno-nationalist influence in the language of 2018 , not 1998. He does what 4Chan, The Daily Stormer and Lauren Southern have honed in on as a key pathway to normalising the ethos of white nationalism — circumventing the instinctive distaste for too-obvious race hate through code and proxy. Fraser Anning, and David Duke want to perform the same gymnastics, but they’re too old, clumsy and inflexible, and hence their attempts are blatant foghorns instead of subtle and toxic double-speak. 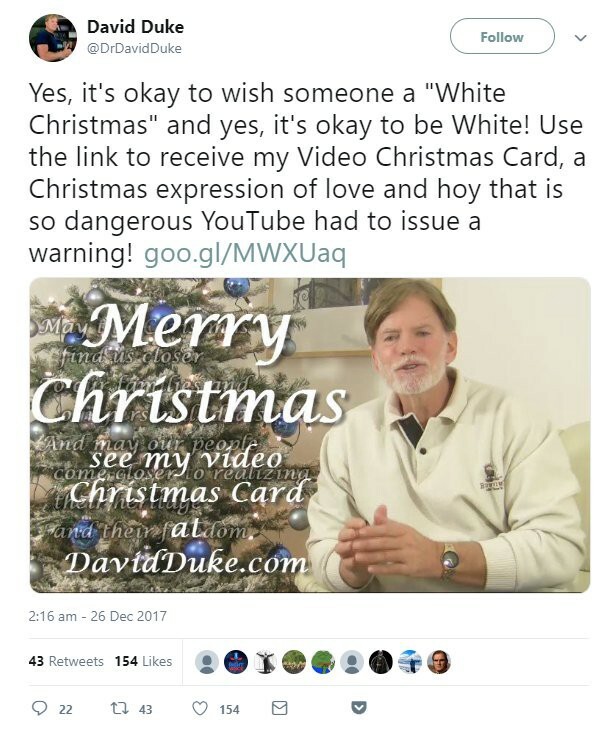 Having a former KKK grand wizard absolutely wrecking the magic of weaponised irony sends those practicing this form of trolling into a metldown of broken logic. More starkly, last Sunday the Australian Broadcasting Corporation revealed that the Nationals party, currently in coalition with the Liberal Party to form the Australian government, “uncovered a covert plot by Australia’s alt-right movement to join major political parties and influence their policy agendas from within.” Also struck off as an ‘accident’, and also realised through coded langauge, like the use of ‘88’ to refer to Adolf Hitler. We can’t continue to skirt around the ways language and irony are being weaponised. The digital spaces creating these ideas outpace and outfox old school modes of journalism. In parallel, ‘classic liberals’ wring their hands about protests and censoriousness threatening free speech and shutting down voices, but are weirdly accommodating of these instances of toxic speech, designed to destabilise, confuse and terrify and ultimately, to incite harm. Our political obsession with culture war combined with our deep-set repetitiveness and lack of inventiveness make us the perfect target for the hucksters importing dumb-as-hell Neo-Nazi memes. They become circular and infinite. 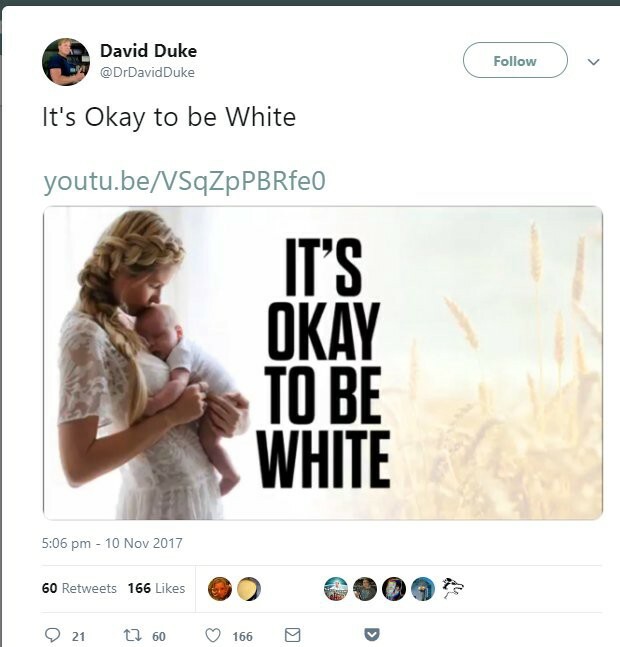 To censor ‘it’s okay to be white’ becomes proof of the victimisation narrative. To allow it furthers the spread of hate. 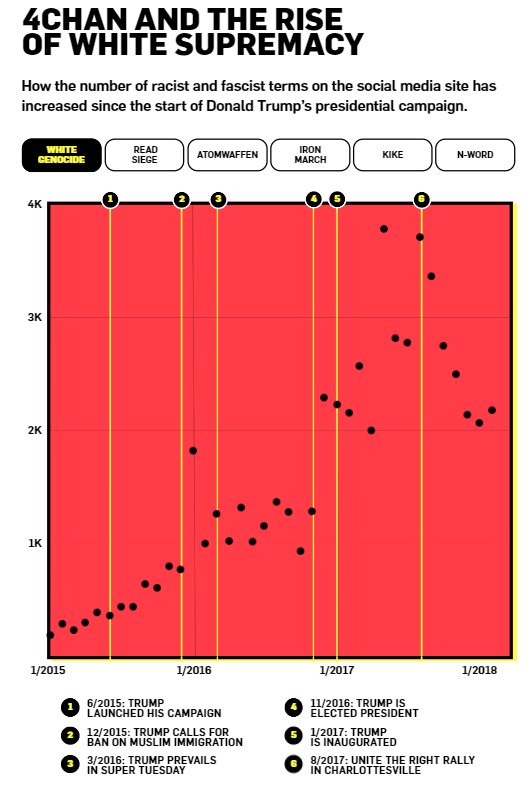 Debating its literal accuracy is fair and balanced.They win every way, hence, it’ll keep happening. 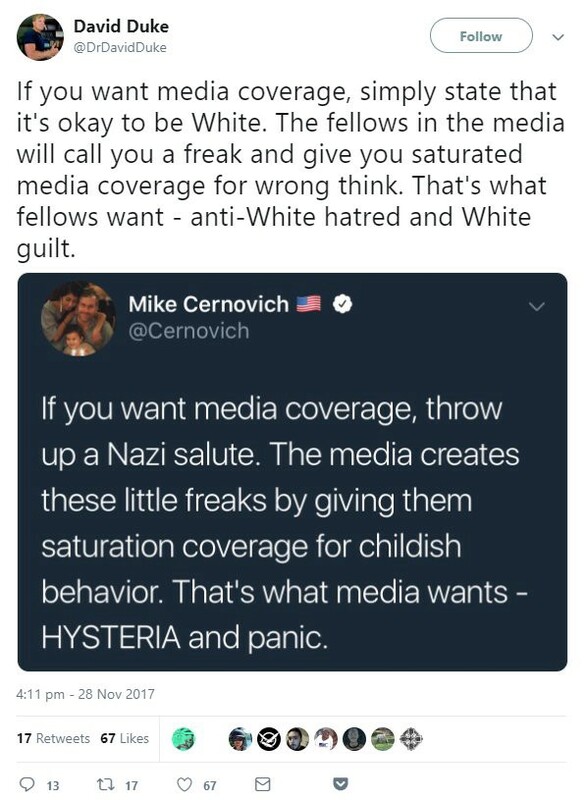 The ‘It’s okay to be white’ ruse is about destruction and destabilisation as much as it is about classic Nazi garbage.